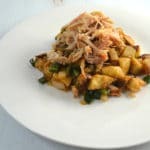 A savory dish featuring pulled pork made in the Instant Pot! Place the cut potatoes into a microwave safe bowl. Cover with plastic wrap, then microwave the potatoes for 10-12 minutes, until they're tender. Set aside. While the potatoes cook, heat a saute pan on medium heat. Cut the pork into 8 pieces. 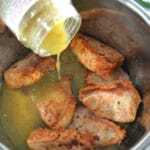 Add one tablespoon of oil into the pan, then sear the pork for 2 minutes on each side, just to get them a nice golden color. Add the pork to your Instant Pot insert. Pour the tomatillo salsa and chicken broth over the pork. Close the instant pot and press the meat/stew button. Once the pork is done, allow the steam to release naturally. 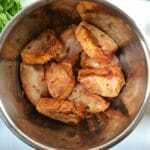 In the same pan that you seared the pork, add the remaining tablespoon of oil. Over medium heat, add the diced poblanos and onions. Season with salt and pepper. Cook for 2-3 minutes. Add the potatoes, paprika, garlic powder and cumin. Cook for 5 minutes, tossing occasionally. 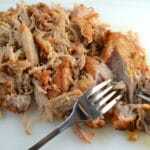 Remove the pork from the instant pot and shred with a fork. 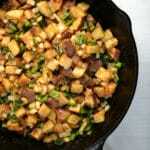 Layer the hash mixture with the shredded pork. 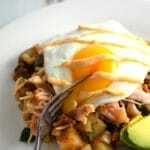 Add a fried egg, or whatever other toppings you like!